Hey people, the dog is the real deal. Wunderdog does his homework and gets the winners period. He's made a winner week after week. Do you like to root for great teams, but don't like having to lay big odds to do so? Then, sign up for my free parlay picks to get access to the Dog's Parlay Club. How many times have you bet on a big favorite only to see them win their game but fall short of the spread? Wouldn't it be nice to win your bets instead in that situation? The Dog's Parlay Club offers you this opportunity. “In the Club, your teams win at a much higher rate. What is the Parlay Club? You can bet your favorite against the spread (which is often inflated), hoping they cover a large spread. Typically these bets win around 50% of the time, losing money in the long term. Half of the time (or more) you are disappointed in the outcome. You can bet the big favorite to win straight-up on the moneyline, risking a lot to win a little (example -400 odds). While the winning rate here is high, it's not fun to risk $400 to win $100. When these teams do lose, it really hurts. Who wants to lay those kind of odds? 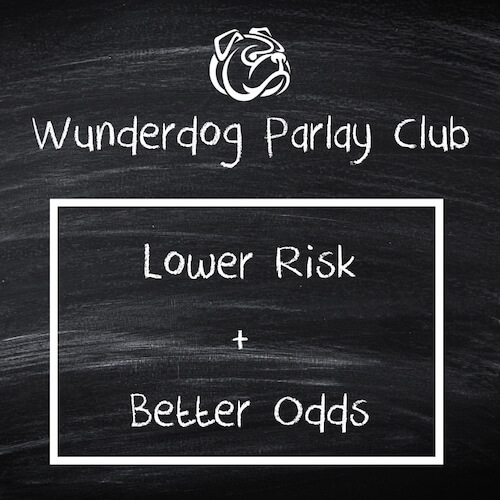 With the Dog's Parlay Club, you have a new option - a better way to bet big favorites. You can bet select favorites to win straight-up, at very reasonable odds. I have spent over 20 years studying sports betting. As part of this process, I have developed a system that selects a small subset of favorites that I believe to be good bets. My system goes one step further, putting these teams into moneyline parlays that offer reasonable odds. The result? We get to root for big favorites to win their games outright. We don't need them to cover large spreads - just get the win. This results in the emotional high associated with winning at a much higher rate. To bet these teams straight-up, you must risk $685 to win $300. Not fun. But, if we put them into a parlay, we get odds of +200. The Upside: Instead of risking $685 to win $300, we risk $100 to win $200! And, we get to root for our big favorites to simply win their games outright (without any spread to cover). When they win by a small amount, we win instead of losing. Of course, if a team loses, the bet loses, so the key is making sure these bets win at high rate. My research has helped me identify only the favorites that have a very high (higher than expected) chance of winning. 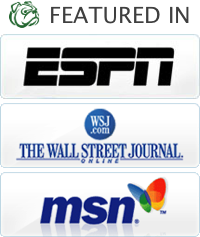 The teams put into these parlays are selected after very careful consideration. Only a very small subset of favorites make the cut. To win! You can expect to show positive net units in the end. To have more fun doing it! It's always fun to root for favorites to win. You can expect games in the parlays to have a 75-80% win rate on average. Some will win at a rate closer to 65% and some will win at a rate closer to 90%, but on average we will get an average win rate in the 75%-80% range. The parlays themselves will win at a 50%-65% rate on average (again sometimes higher or lower but the bulk will fall in this range). Given the high game win-rate, and the benefit of rooting for superior teams to simply win their games outright, you will have more fun rooting for these picks because you will win more often. The parlays will include teams across all sports that are active at the time. I will release one to two parlays per day on average (some days will have none, some days will have more). We will not have picks every day because I am being very selective on the teams that qualify for the system. I will never "force" a play just to have action. The parlay odds will usually be in the range of -200 to +200. This means you will usually be risking $100 to win anywhere from $50 to $200 on average. Occasionally, odds will fall outside this range, resulting in lower or higher payouts for a $100 bet, but the majority will fall within in the -200 to +200 range. This service is independent of my other more traditional offerings and can be purchased in addition to, or in place of any of my other picks packages. Combine the Blue Jackets +1.5 (-220) and the Raptors (-600) into a 2-team parlay at -143 odds. Combine the 76ers (-340) and the Warriors (-1100) into a 2-team parlay at -243 odds. Combine the Maple Leafs +1.5 (-210) and the Warriors (-1000) into a 2-team parlay at -160 odds. Combine the Hurricanes +1.5 (-185) and the Warriors (-1000) into a 2-team parlay at -144 odds. Combine the Spurs (-265) and the Rockets (-1900) and the Warriors (-1800) into a 3-team parlay at -189 odds. Combine the Spurs (-600) and the Warriors (-350) into a 2-team parlay at -200 odds. Access all of my previous parlay picks here. Win or lose, I give you visibility to all past pick statistics including my in depth newsletter write-ups. Click here to purchase a premium Parlay Club picks package, you'll have access to weekly picks, detailed write-ups, game information and top of the line customer service.